Events provide a great opportunity to promote your business. Whether you are promoting a product, hosting an in-store promotion, exhibition or other event; event filming is a great way to translate the energy and excitement from the day. Promoting previous events success is often imperative to the success of your forthcoming events. Show off your assets to your prospects in a way that’s easy for your audience to understand! When events go well, you will want to tell everyone of your success. Communicating your success through video offers the opportunity to communicate the energy and atmosphere from the day to your audience. Helping people understand ‘what they missed out’ makes them more eager to want to attend a future event. Audiences who can’t attend, can be invited to tune in online to watch a live stream of the event. If your audiences are in many locations or if your venue is too small; your audience can now visit your website and watch the event live. 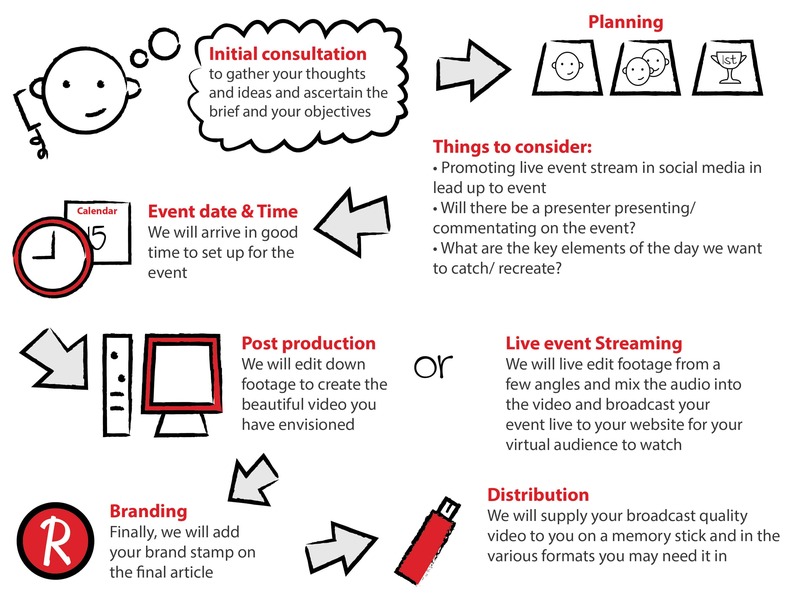 Live event streaming your event drives more traffic to your website, gives more to talk about in the lead up to your event on your social media, regular updates etc. Broadcasting your event live extends your audience to include virtual attendees thereby improving your brand exposure, brand interaction and internet marketing services. Our film production services ensure live event coverage is covered be it for live event streaming purposes or for post production/ short film later. Red Shell Productions have the capability to handle your audio/ visual production requirements for your event video.